Scientists at NASA's Jet Propulsion Laboratory (JPL) in Pasadena, California and the University of California, Los Angeles (UCLA) have been collaborating to design a Wi-Fi chip that could bring great power savings to connected mobile devices like wearables. 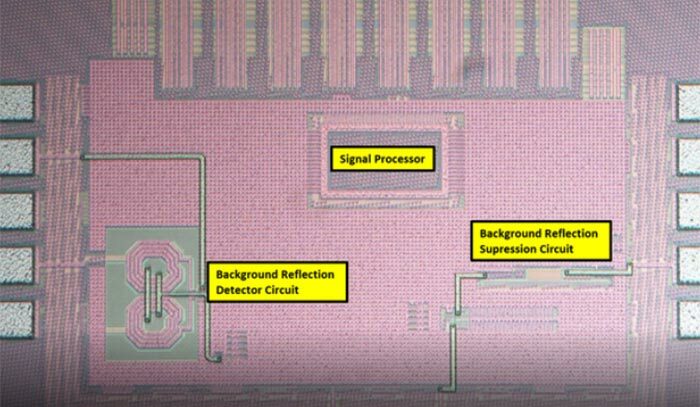 By using the principle of reflection the scientists have managed to make a Wi-Fi chip that doesn't need a regular transmitter / receiver component. In tests, the newly designed chip was able to cope with data at around 330Mbps "using about a thousand times less power than a regular Wi-Fi link". That speed was achieved over a distance of 8ft (2.5m). Thus a wearable device with this chip equipped could transfer/receive a large file like an HD video in a few seconds. The chip was also tested at distances up to 20ft (6m) but we haven't been told the speed/power consumption result under those circumstances. "Information transmitted to and from a wearable device is encoded as 1s and 0s, just like data on a computer. This needs to be represented somehow in the system the wearable device uses to communicate. When incoming energy is absorbed by the circuit, that's a "0," and if the chip reflects that energy, that's a "1." This simple switch mechanism uses very little power and allows for the fast transfer of information between a wearable device and a computer, smart phone, tablet or other technology capable of receiving the data." The scientists had to work around several obstacles in order to get the reflective system working. Most importantly the device had to overcome background reflections off objects within the environment which would confuse the signal – this issue has been worked around with a silicon chip that can sense and surpress such 'noise'. Another wrinkle, and it is one the researchers are still working on, is that the reflecting Wi-Fi chip requires the Wi-Fi router or base station to use more energy in its transmission / receiving work. That might not be very important, as your Wi-Fi router will probably be plugged in to the mains, and a wearable may only need short bursts of data periodically. Obviously NASA is seeing the potential of this technology built into astronaut smartwatches and so on but hopefully it will also reach consumer devices. The organisation which manages the NASA JPL and UCLA owns the patents for this reflective Wi-Fi chip technology and has already has agreements to commercialise it. … so you loose apps which must be restarted after every connection loss.